In the natural sciences, it is common to have incomplete or unevenly sampled time series for a given variable. 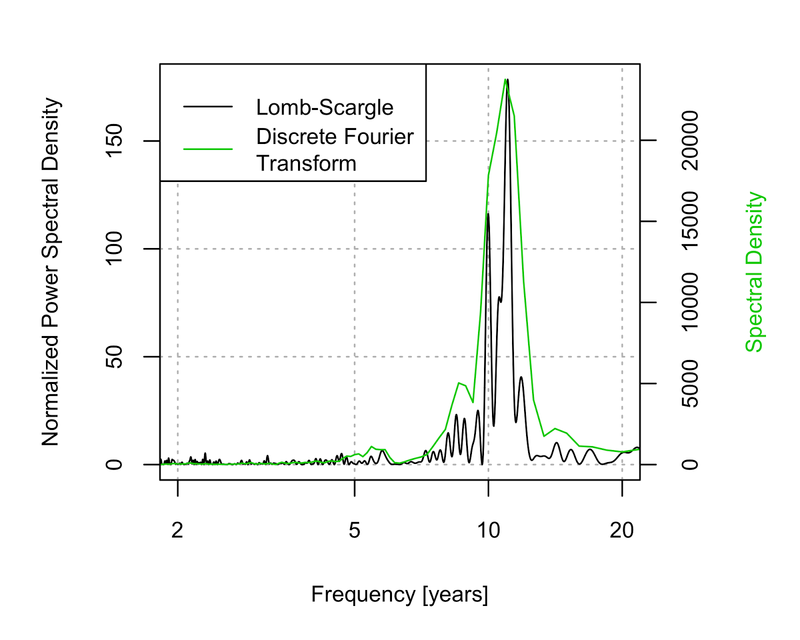 Determining cycles in such series is not directly possible with methods such as Fast Fourier Transform (FFT) and may require some degree of interpolation to fill in gaps. An alternative is the Lomb-Scargle method (or least-squares spectral analysis, LSSA), which estimates a frequency spectrum based on a least squares fit of sinusoid. 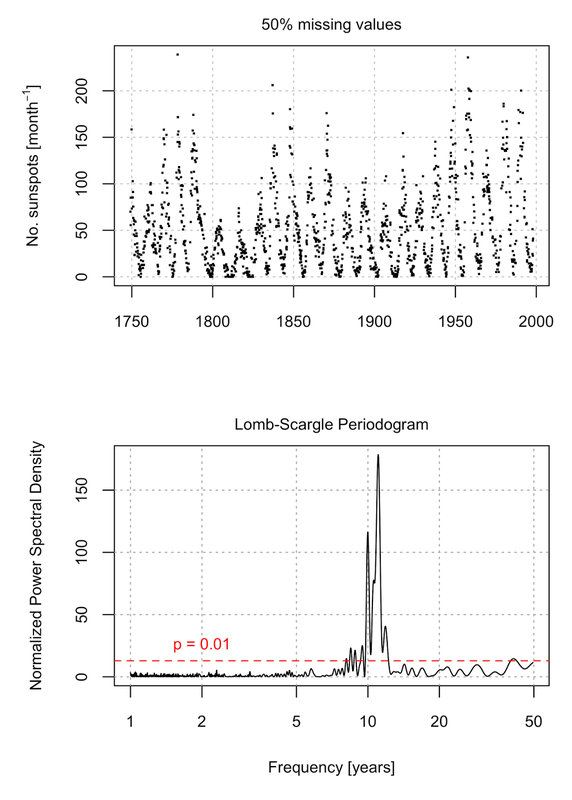 The above figure shows a Lomb-Scargle periodogram of a time series of sunspot activity (1749-1997) with 50% of monthly values missing. As expected (link1, link2), the periodogram displays a a highly significant maximum peak at a frequency of ~11 years. The function comes from a nice set of functions that I found here: http://research.stowers-institute.org/efg/2005/LombScargle/R/index.htm. An accompanying paper focusing on its application to time series of gene expression can be found here. Below is a comparison to an FFT of the full time series. For another great resource on spectral analysis, and time series-related R methods in general, see the following website: http://zoonek2.free.fr/UNIX/48_R/15.html. data(sunspot.month) # Historical sunspots, class(sunspot.month) = "ts"
#1. time series. The peak of the loess-smoothed curve (dotted line) is used for phase. To leave a comment for the author, please follow the link and comment on their blog: me nugget.